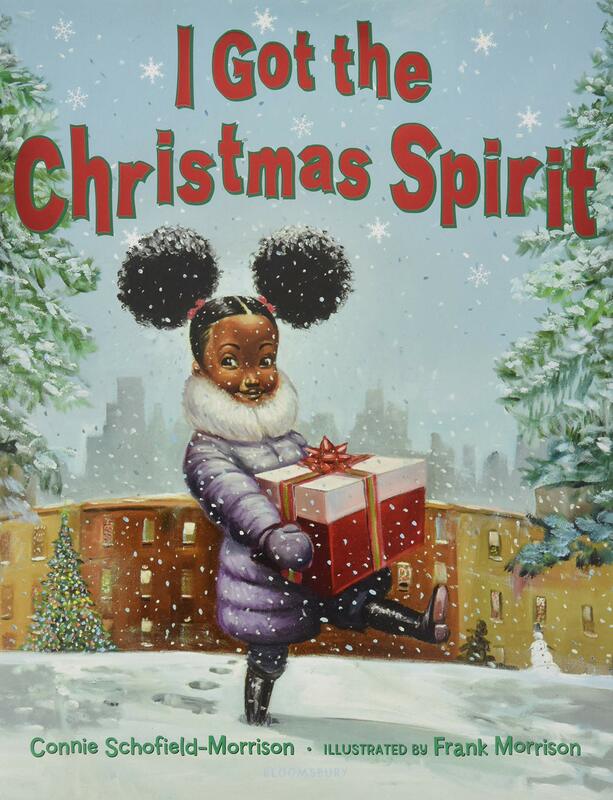 Summary: From the author-illustrator team that created I Got the Spirit comes this exuberant ode to Christmas. A little girl goes travels around the city with her mother, excited about Christmas as she embraces its true spirit of giving. She enjoys singing with carolers, eating crunchy chestnuts, and ice skating in what looks to be Rockefeller Center. She also donates to the Salvation Army and finds a way to help a mother and daughter who are standing on the street with a sign reading “Help, please”. At the end, she and her mom meet up with her father; as he scoops her up in an embrace; the final page reads, “Peace for all, good tidings, and cheer–let’s live the spirit every day of the year.” 32 pages; ages 3-8. Pros: The text is simple, interspersed with rhythmic words (“Dingle Dingle”, “Zoom Zing”). Readers will want to pay close attention to the colorful oil paintings to see exactly how the girl expresses her Christmas spirit. This would be a perfect opening to a discussion about the Christmas spirit and how to spread it. Cons: This seemed like it should be a rhyming text.